Given that there is no cashflow for fine wine and it pays no dividends, the fundamentals to assess its ‘value’ are rather elusive. But what it is possible to assess – and therefore, in our opinion, an essential aspect of wine investment analysis – is relative value. But the vast diversity of the market makes this highly challenging. How do you compare two different wines from different estates, produced in different countries in different years with dramatically different prices? For this, we have developed our MARRVIN (Mathematically Automated Risk and Relative-Value Investment Number-Cruncher) system. MARRVIN is essentially a sophisticated algorithm which allows us to compare the relative value, risk and financial potential of fine wines. MARRVIN processes market data (critic’s scores, price history and volatility, brand power, production levels, regional vintage quality, optimum drinking age etc.) and calculates various outputs, which when combined help us assess the potential risk and reward for a given wine. If a wine falls below the relevant benchmark figure we rule it out of our stock selection, allowing us to focus on a reduced universe of wines, and thereby reducing the risk of our recommendations depreciating in value. 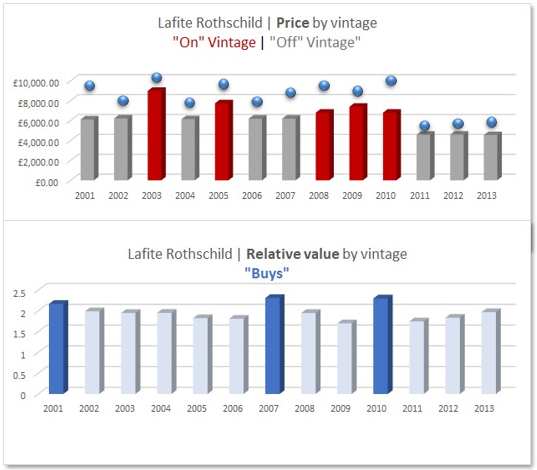 The chart right shows the prices of Lafite Rothschild over 12 vintages. “On” vintages are marked as the red columns, and are as expected more expensive that the “off” vintages. The blue dots represent the outputs from the algorithm. Neither absolute figure gives clues to the best investment. However, a clear picture of relative value unfolds when you divide each of the variables by the price of the wine. The results of this process can be seen in the chart right. The bright blue bars are the best investment buys on a relative value basis. 9. Supply to market over time. 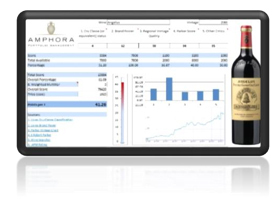 The Amphora proprietary algorithm considers some 141 producers over 23 vintages (so 3243 possible investment opportunities) both vertically and horizontally on a daily basis, thereby modelling the market on a relative value basis. This process highlights anomalous pricing and pockets of value, as well as reducing the universe of wines considered on an individual basis by the Amphora team. It must be stressed that the Algorithm alone is not a tool for making investment decisions, but rather an invaluable tool in leading the team to promising prospects for the essential qualitative overlay. Potential recommendations would be subjected to vigorous qualitative selection processes which is where our experience and knowledge of the market will help ensure levels of risk are kept as low as possible and potential stock appreciation levels maximised. All charts are for illustrative purposes only, and no purchasing decision should be based upon them. We believe that investing in wine should be both enjoyable and profitable, but like any traded commodity there are risks and wine can go down in value as well as up. Amphora is an audited member of the Wine Investment Association, but neither Amphora nor the wine market in general is regulated by the Financial Conduct Authority. © 2009 Amphora Portfolio Management Ltd. All Rights Reserved.